This morning on NBC's "Meet the Press," former Secretary of State Colin Powell crossed party lines to endorse Barack Obama for president. Powell specifically cited Senator Obama's handling of the current financial crisis, his "ability to inspire" and the "inclusive nature" of Obama's campaign as some of the reasons for his endorsement. "He has both style and substance," Powell said of Obama. "I think he is a transformational figure, he is a new generation coming onto the world stage, onto the American stage, and for that reason I'll be voting for Senator Barack Obama," Powell said. "Senator Obama displays a steadiness. He shows intellectual vigor. He has a definitive way of doing business that will do us well." Powell said that John McCain has been a good friend for 25 years. 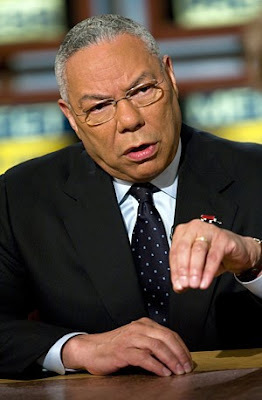 But Powell expressed disappointment in the negative tone of McCain's campaign, as well as in his choice of Sarah Palin as the Republican vice presidential nominee. "Now that we have had a chance to watch [Governor Palin] for some seven weeks, I don't believe she's ready to be president of the United States, which is the job of the vice president," Powell said. "And so that raised some question in my mind as to the judgment that Senator McCain made." And it was a refreshing surprise to hear a leading American figure rise in defense of Muslim Americans against stereotypes about their patriotism. For months, rumors have spread that Senator Obama, whose father was Kenyan, was a Muslim. In fact, the Illinois senator is a Christian. But Powell is the first high-profile leader to raise a larger question, to wonder what would be disqualifying if Obama were a Muslim American. Telling the story of a mother at the Arlington Cemetery graveside of her 20-year-old son, Kareem Rashad Sultan Kahn, who died for his country in Iraq, Powell said the "right response" to rumors that Obama is a Muslim is not only to deny them but to expose them as bigoted and un-American. When I first read this, I got such a wonderful feeling inside. Powell said every single thing that Republicans should be saying about how this campaign has been run. And then I saw that photo of the woman who lost her son in Iraq. The government has so much to make amends for. And John McCain should resign from the Senate if and when he loses.